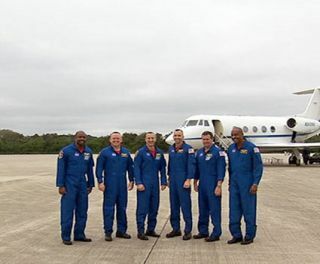 The six STS-129 astronauts after arriving at NASA's Kennedy Space Center in Cape Canaveral, Fla. Nov. 12. The skies above NASA's Florida spaceport look to be clearfor tomorrow's planned launch of the space shuttle Atlantis. Atlantis is slatedto lift off at 2:28 p.m. EST (1928 GMT) on Nov. 16 from Launch Pad 39A atKennedy Space Center in Cape Canaveral, Fla.
"It?s a beautiful day here at Kennedy SpaceCenter," said shuttle weather officer Kathy Winters during a Sundaybriefing. "Tomorrow is going to be very similar." Winters predicted only a 10 percent chance of a cloud ceilingmoving in over the launchpad to prevent a flight on Monday. The main weather concerns are predicted swells and high seasin the Atlantic Ocean off the coast of Cape Canaveral, where boats plan to retrievethe shuttle's spent solid rocket boosters after liftoff. If the waves are toohigh, the recovery teams may have to wait to fetch the boosters. The issue isnot a constraint for launch, though. The countdown towardliftoff is underway for Atlantis, with the large metal protective shroudcovering it at the launch pad set to be removed Sunday at 5:30 p.m. EST (2200GMT). Ground teams will begin loading the shuttle's huge orange external tank withits liquid oxygen and liquid hydrogen propellants at around 5 a.m. EST (1000GMT) on Monday. "We've had a very clean countdown to date and are currentlyon schedule with no problems to report," said NASA test director StevePayne. The STS-129 mission is a planned 11-day trip to the InternationalSpace Station to deliver two carriers filled with large spare parts. CommanderCharlie Hobaugh is set to lead six astronauts on the mission, including threefirst-time spaceflyers. "At this point we're in very good shape ? Atlantis isready to launch, the team is ready to launch, and I know that the flight crewis ready to launch," Payne said. SPACE.com is providing complete coverage of Atlantis'STS-129 mission to the International Space Station with Managing Editor TariqMalik and Staff Writer Clara Moskowitz in New York. Click here for shuttle missionupdates and a link to NASA TV.